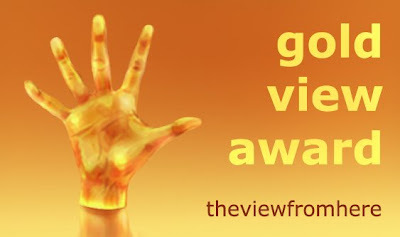 The View From Here is proud to present our next Gold View Award to ..
Interspersed with snippets from his personal life, topics as diverse as library management systems, reading practices and trends, literary news and publishing are covered alongside a host of book reviews from just about every conceivable genre. Indeed, there’s no stone left unturned when it comes to talking about the wonderful world of books from the perspective of a consummate book lover. Written in a relatively factual manner it can take a while to acclimatize to the author’s unique style but it is certainly worth doing so because there is a feast of information and knowledge to be gained at Book Calendar. And just like a favourite novel, once you’ve got the measure of it, you’ll want to go back time and time again. To visit Book Calender's blog click here. Notes on the Award: The Gold View Award will be awarded by the magazine every quarter. It is not a "chain" award, that is, it cannot be passed by those receiving it onto others. We award it to sites that we feel go the extra mile - either in their look, content or we just think they are amazing! In other words gold! Yep, this is a well deserved award for a most interesting and informative site. where the writer may fit into a category, like books, but takes their blog so much farther that it reveals life anew. I'll ditto Lady T, Stella and Kathleen. Many congrats, Book Calendar. It is important to go a little farther than just the contents. There is so much more to books; there is the design, the art, and the experience that go with libraries, bookstores, and all things literary.